Posted on 01-22-18 at 5:01 p.m.
One of the fundamental motivations in the psychology of individuals in modern societies is undoubtedly the need for achievement: a need for fulfillment, to progress and master high-level skills, to achieve difficult goals, a determination to win, to prevail. The concept was popularized in the 1960s by American psychologist David C. McClelland. He concluded that in a society, the more people are driven by this need (the more "achievers" there are), the more sustained economic development and growth there will be (The Achieving Society - Princeton, D. Van Nostrand Company, Inc., 1961). Even though his theory did not go unchallenged - other factors undoubtedly influence a society's economic development - the fact remains that the presence of a critical mass of "achievers" will contribute to a society's dynamism. Our research indicates that the "need for achievement" in the country has had its ups and downs in recent years. 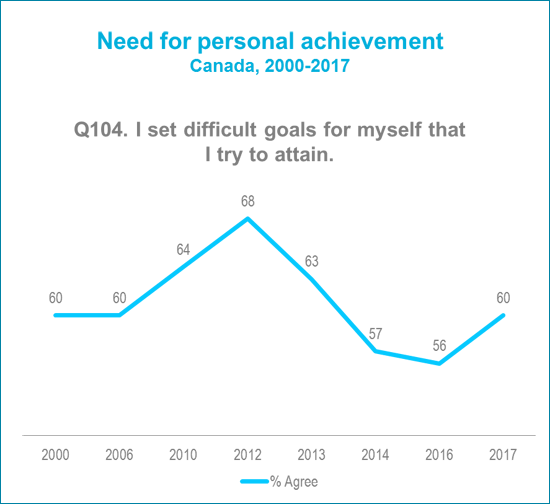 In 2017, the most recent year we measured this phenomenon, three Canadians in five (60%) agreed with the statement "I set difficult goals for myself that I try to attain". 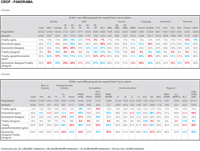 Note that the most inspired, the most motivated by this need for achievement represent only 14% of the population. Nevertheless, when 60% of people agree with the statement, we reach a critical mass of "achievers" (both strong and moderate"), which sustains a certain degree of dynamism in our society. It is also fascinating to observe this phenomenon's relationship to age. While 60% of Canadians agree with the above statement, this proportion is 75% among 18-24 year-olds. From there, agreement steadily declines in linear fashion to 47% in seniors 65 and over. As we get older, this dynamism, our need to achieve, seems to wither. A bit unsettling given our aging population! The level of "achievers" also varies significantly by socioeconomic context, creating a very interesting indicator of society's general "mentality." During the 2000s, the need for achievement has progressed somewhat. From 2000 to 2006, as in 2017, 60% of Canadians consistently agreed with the above statement; from 2006 to 2012, the level gradually rose to 68%. The favorable economic conditions prior to the recession seem to have encouraged a certain amount of dynamism, a mentality that continued until 2012 despite the recession. During the recession, Canadians expressed some degree of resilience (several of our other indicators support this interpretation), but around 2012, this resilience began to run out of steam. At that time, Canadians gave up on the idea that life would be easier post-recession. They realized that life was becoming infinitely more complex and uncertain, that a new world order had arrived and that it was here to stay. Thus, the level of "achievers" took a deep dive, from 68% in 2012 to 56% in 2016, a plunge of 12 points in four years! Even though the post-recession has proved no worse for most people than the recession itself (economically, socially, ecologically, etc. ), our dynamism has obviously taken a hit. However, in 2017, along with a significantly better economy, the level of "achievers" rose to 60%. While it would be unreasonable to suggest a "causal" relationship between the latest economic performance and our "achievers" measurement in the country (or vice versa), the synchronicity in the movements of these indicators is worth noting. However, since we often say in our business that "a swallow does not a summer make ," we must be cautious about this sudden rise in the level of achievers in 2017. Our next surveys on this topic will either confirm this trend, or not. It is fascinating to observe the role that goal-setting plays in the lives of the people who express a need for it. It becomes a source of meaning, a way to express who they are, to get in touch with themselves. Goals, their attainment and the way they are attained, become a way to express our uniqueness, who we are, a source of personal fulfillment, a kind of social marker. Goal-setting and challenging ourselves feed our identity, both for ourselves and as a way to communicate with others. Indeed, goals are also about status, a way to mark one's social identity, to affirm the "strength" of one's identity. Note, too, that these "achievers" fantasize about civil disobedience, as if to achieve their goals, any "means justify the ends"! Even though McClelland's thesis was dismissed as simplistic, too causal, people's need for achievement as a motivation remains an important driver in adding value to society, whether economic, cultural or otherwise. Given the anticipated changes in our society, it is certainly timely that a critical mass of individuals across the country are taking the bull by the horns, challenging themselves and transcending their limitation in significant ways. Theirs will be a welcome contribution to the vitality of our society. Let's hope that the coming years will provide a favorable climate for this desire for achievement. This week's lyrical clip comes from Mozart's opera, Così fan tutte. One of the most famous challenges in opera is surely the challenge presented to two young men to prove the fidelity of their fiancées, while trying to make them believe that fidelity is unrealistic, utopian (thus do they all - Così Fan Tutte - they say, when discussing the alleged faithlessness of women). The musical excerpt presents the exact moment when these young men are challenged to test the fidelity of their lovers. All in a superb, ultra-modern production by the Madrid Opera, produced by Michael Haneke, Austria's Robert Lepage. Wolfgang Amadeus Mozart: Così Fan Tutte – Anett Fritsch, Paola Gardina, Juan Francisco Gatell, Andreas Wolf, Kerstin Avemo, William Schimell, Chorus and Orchestra of the Teatro Real de Madrid, Sylvain Cambreling (Dir. ), Michael Haneke (Prod. ), C Major Entertainment GmbH, Berlin, 2013. Posted on 12-21-17 at 10:41 a.m. I shall join the rest of you and take a short break over the holidays. The longer I pursue this new publishing venture, the more I enjoy it, and your feedback. More and more of you are following me online. Many of you have become faithful readers, for which I am exceedingly grateful. Thank you for your diligence and constructive comments. I greatly appreciate them. As the holiday season is a time to relax (and I hope you will, too), I will resume my posts in the New Year. Merry Christmas, and best wishes to you and your loved ones for a Happy 2018! Posted on 12-20-17 at 2:24 p.m. Published on La Presse+, here’s a summary of a study on public services in Quebec conducted by CROP for GESTION, HEC Montréal’s magazine (French only). 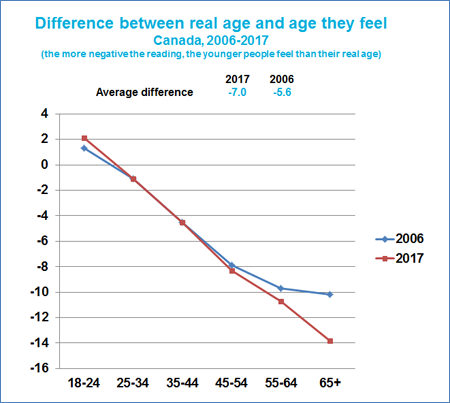 Posted on 12-04-17 at 4:51 p.m.
A very intriguing trend seems to be emerging in the social and consumer psychology of Canadians: a marked decline in the need for status recognition and personal pride. Although we can use several indicators to measure this driver and its impact on consumption, one of the most reliable indicators, according to our analyses, is the need to feel admired by other people-an indicator in dramatic decline since 2014. A large critical mass of people still continue to be motivated by this "hot button," particularly in Quebec, but overall this driver seems to be falling, at least since 2014. We normally prefer to draw conclusions about trends from data collected over longer periods of time, but the sharp drop in this indicator since 2014 is certainly striking. Prior to 2014, our indicators for this motivation were unchanged. Hence, this trend seems to be relatively new. 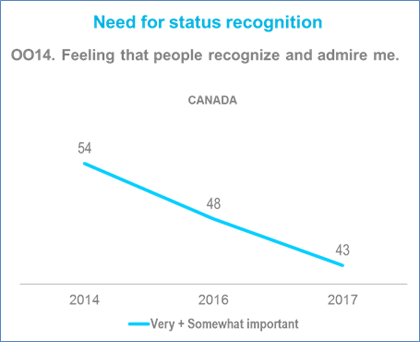 In fact, the proportion of Canadians who crave status recognition and admiration from other people has fallen from 54% to 43% since 2014, a 12-point drop. Even in Quebec, which has been and continues to be the country's "proudest" province, the proportion of recognition-seekers has dropped from 64% to 52% over the same period. Surprisingly, even the younger generation, the 18- to 34-year-olds (the proudest cohort we measure), display a similar decline in their need to feel recognized and admired. Since 2014, their agreement with our question fell from 63% to 57% (from 74% to 62% in Quebec!). 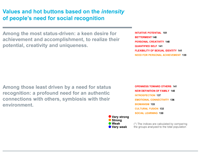 We find this trend particularly intriguing because most of the brands and market segments we work on for our clients are positioned on a "sociocultural map" where status recognition (pride) is a very important motivator, one that drives consumption and consumer choices. Pride in owning a sought-after product, showing off a prestige brand ("masstige" or mass-market luxury): these are extremely important drivers, motivating consumption by large segments of consumers (buying the latest iPhone, a pair of Ferragamo shoes, etc.). Given that we often work with consumers who expect the brands they buy to deliver a status boost (or an experience that makes them feel proud), we find it very surprising that this motivation is trending downward. This development suggests that brands and companies need to do much more to segment their markets and target their customers. If the need for status recognition is indeed on the wane, it may be necessary to exploit other hot buttons to promote their products, based on the type of consumer being targeted (unless you're targeting only the consumers who want products and services that confer a sense of pride and status). Businesses, must properly segment their markets and target clientele in order to send the right message to the right people. It should also be noted that, along with the younger generation, employed individuals and professionals display a markedly strong need for pride and social recognition. However, they too are showing a diminished need for this kind of validation, in line with the general population. When we analyze the values and hot buttons associated with a desire for status recognition and those associated with its decline, we get a very clear picture of what is happening. On the one hand, the most "status-driven" individuals are charged with a strong need to excel, to realize their potential, display their creativity and their uniqueness. Status recognition is their "reward" for achievement. This kind of motivation has a very dynamic effect on society and the economy. The more people there are in the workforce who have this keen desire to excel and take pride in their accomplishments, the better shape the economy will be in, since they will inevitably bring some of this dynamism to their work. On the other hand, those less motivated by this need for status recognition, whose numbers have steadily increased since 2014, express a keen need for authentic connections with others, a desire for personal fulfillment based on a symbiotic relationship with their environment (people, nature, life). Rather than being concerned with status, they are interested in more meaningful and authentic relationships with others-and equate pride with vanity. What our society loses in economic vitality due to a diminished desire for status recognition it gains in authenticity. However, for the time being, young people are the primary drivers of our dynamic new digital economy, and their desire for achievement and status recognition, even if less strong than before, is still sufficiently vibrant to keep the economic boat afloat! These findings makes sense in the context of an aging population. When we reach a certain age, we tend to have less to prove to ourselves, and authentic relationships with those close to us takes precedence over jockeying for social status. Moreover, a less frenzied contribution to the economy can still create value, while encouraging greater humanism, which can only benefit society. Although innovation is spawned by a demographically small number of individuals, we fully expect a flood of innovation over the next few years! Historically, when economic conditions are good (Canada hasn't done too badly in recent years), authenticity can thrive. Conversely, in more perilous times, people are afraid of moving downward on the social ladder (or on Maslow's hierarchy of needs pyramid), which exacerbates their concern for social status and recognition. Given the foreseeable technological and economic disruptions in the medium term, the country's future economic conditions may well put a strain on this emerging movement of authenticity! Only time will tell. When we refer to this opera or to Alexandre Dumas' novel, La Dame aux camélias (The Lady of the Camellias), which inspired it, we are normally referring to the heartbreaking story of love thwarted by the heroine's immanent death and the inflexible class structure of 19th-century French society. However, a crucial element of the story that is often overlooked is the frantic desire for social recognition by the main character (Violetta, la Traviata). She is a marvelous incarnation of a social climber with her craving for prestige and admiration-for the kind of social mobility that could only prove exceedingly difficult for a courtesan in Parisian society at that time. Giuseppe Verdi: La Traviata - Anna Netrebko, Rolando Villazón, Thomas Hampson, Konzertvereinigung Wiener Staatsopernchor, Wiener Philharmoniker, Carlo Rizzi (Dir. ), Willy Decker (Prod. ), Salzbourg Festival, 2005, Deutsche Grammophon.